DNR chart of Iowa greenhouse gas sources. The annual report on greenhouse gases in Iowa shows the emissions of those gases has fallen for the second year in a row. DNR- senior environmental specialist, Marnie Stein, says statewide emissions decreased by 2 percent from 2015 levels. The power plant emissions decreased by 14 percent in the last year. “It’s a combination of some units switching from coal to natural gas and then some units not being run because there is enough wind in the state to provide electricity on some days,” Stein says. The emissions from power plants were the only greenhouse gas source in the state to see a decline in this year’s report, and they offset the increases in other areas, which were about 5 percent. 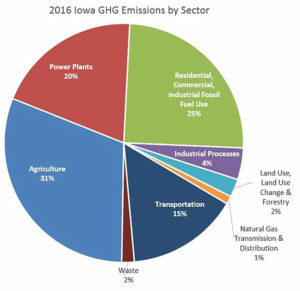 “The largest source of greenhouse emissions in Iowa are actually in agriculture –they are about 31 percent — and then power plants emit about 20 percent. And then fossil fuels used by homes, businesses and industries is about 25 percent, and then transportation is about 15 percent,” according to Stein. There are a couple of sources of emissions from agriculture. “The majority of emissions from agriculture are from crop production, from fertilizer which goes through the nitrification process which emits N-2-O — which is a greenhouse gas,” Stein says. “And the other half of emissions are from animals — from things like cows — and then manure.” Stein says the agriculture emissions are estimated using formulas based on the amount of acres farmed and the number of animals. This is the 11th greenhouse gas inventory report that is mandated by the Iowa Legislature to document emissions trends and track progress in reducing emissions. Find the complete report on the DNR’s website.